For years, efforts to capture space debris and remove it from orbit faced a conundrum: Who would pay for the service? Little government funding is available. Insurers are not stepping up. And individual satellite operators showed little interest because while the problem is growing, the threat to any single spacecraft remains incredibly small. Finally, entrepreneurs and space policy experts think they have an answer. The megaconstellations promising global broadband service are heightening concern about orbital debris and creating demand for space-based trash collection. Dan Ceperley, chief executive and co-founder of LeoLabs Inc.
“We are going through a once in a lifetime revolution,” said Dan Ceperley, chief executive and co-founder of LeoLabs Inc., a startup offering satellite operators collision avoidance and debris-mapping services. 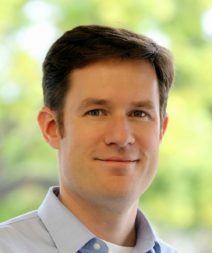 “The number of active satellites is increasing dramatically and these large constellations with a lot of satellites in roughly the same altitudes have a different collision risk than prior users of space with fewer satellites more spread out,” Ceperley said in February at the SmallSat Symposium in Mountain View, California. Because their collision risk is higher, the new constellations look like a promising market for satellite removal. Plus, a constellation’s defunct spacecraft could threaten its working satellites traveling in the same orbit. “The constellation operators don’t want their dead satellites hitting their active satellites,” said Hitchens, former director of the United Nations Institute for Disarmament Research in Geneva. Nor do constellation operators want to pollute low Earth orbit. “When people are spending billions, they don’t want to create problems,” said Ted Muelhaupt, associate principal director of The Aerospace Corporation’s Systems Analysis and Simulation Subdivision. As the business case becomes clearer, entrepreneurs and government researchers are preparing to tackle the technological challenge of active debris removal. Here’s a look at a few of those projects. 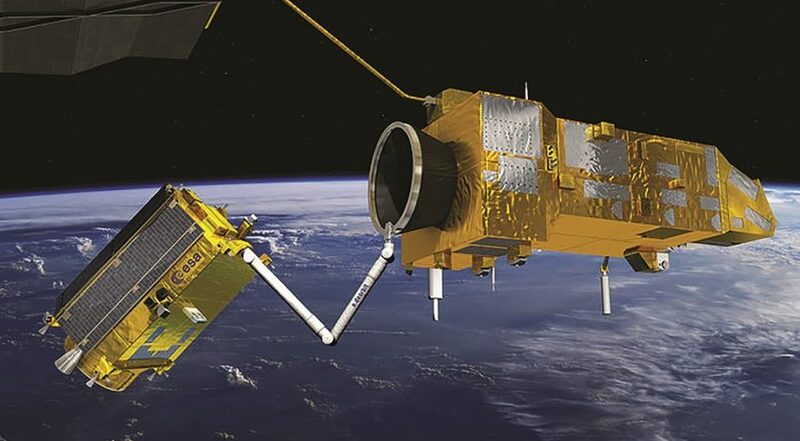 First up is RemoveDEBRIS, an initiative led by the University of Surrey and 10 international partners, including Surrey Satellite Technology Ltd. (SSTL) and Airbus Defense and Space, and sponsored by the European Commission and the Surrey Space Center. On April 2, a SpaceX Falcon 9 rocket and Dragon cargo capsule delivered the 100-kilogram RemoveDEBRIS satellite and two cubesats to the International Space Station, where they will be stored for weeks until the NaoRacks Kaber microsatellite deployer sends them into orbit. Once in orbit, the RemoveDEBRIS spacecraft will demonstrate four technologies for debris removal. It will observe and approach the target cubesats using cameras and lidar. It will catch one cubesat with a net and send a harpoon through a plate made of satellite panel materials to demonstrate how that type of weapon would work in space. Then, the RemoveDEBRIS satellite will attach a large drag sail to a cubesat to reduce its orbital velocity and speed its reentry in Earth’s atmosphere, Guglielmo Aglietti, Surrey Space Center director, said by email. Astroscale, a startup based in Singapore that conducts research and development in Tokyo, plans to offer end-of-life services to large constellation operators who take steps before they launch satellites to make them easier to retrieve in orbit. Satellite operators traditionally save fuel for the end of their space missions when they are ready to dispose of satellites. “But if that satellite fails in orbit and is not able to perform that end-of-life service, we think satellite operators should have a backup deorbit mechanism on all the satellites they launch,” Chris Blackerby, Astroscale chief operating officer, said at the SmallSat Symposium. The company estimates that five to 10 percent of the megaconstellation satellites will fail. “We’ll go up and take them down,” Blackerby said. Astroscale plans to demonstrate its technology in late 2019 with its ELSA-d, or End of Life Service Astroscale-demonstration, mission. In that mission, Astroscale’s “chaser” satellite will launch attached to a small satellite built by SSTL. In orbit, the two satellites will separate and perform a series of demonstrations showing, for example, that the chaser can approach the small satellite and grab it with high-performance magnets. After Astroscale begins serving constellation operators, the firm will tackle the more challenging job of picking up failed satellites and spent rocket stages for space agencies or intergovernmental organizations, Blackerby said. The leaders of CleanSpace One, the long-running campaign by the École Polytechnique Fédérale de Lausanne (EPFL) to capture and deorbit its own cubesat, SwissCube, are beginning to work with industrial partners who can turn their technology into a commercial product, said Muriel Richard, CleanSpace One project manager. EPFL has been working on the CleanSpace One mission since 2012, “which gave us time to vet every possible capture mechanism,” Piguet said. In the end, they settled on the “Pac-man” approach, a conical structure resembling a net to envelope its target and place it on a path to atmospheric reentry. Until recently, ESA was planning the most ambitious debris removal demonstration: capturing its 8,000-kilogram Envisat environmental-monitoring satellite in 2023 and performing a controlled atmospheric reentry. Now, ESA is exploring synergies between on-orbit servicing and debris removal spacecraft. At the same time, ESA’s Clean Space Office will receive roughly 10 million euros in 2018 to develop technologies with applications for satellite servicing and active debris removal. The Aerospace Corporation’s Brane Craft is designed to scoop up small pieces of debris, ranging from about one-tenth of a kilogram to 10 kilograms. In 2017, Siegfried Janson, an Aerospace senior scientist, won a two-year NASA Innovative Advanced Concepts award worth about $500,000 to continue developing Brane Craft, a flat, flexible spacecraft, measuring one square meter that is designed to envelope debris and remove it from orbit. In the next year, Janson plans to demonstrate key Brane Craft technologies including transistors, logic gates and photodetectors able to withstand radiation because “this spacecraft has no radiation shielding,” he said. After that, “we’ll have to see who wants to sponsor further development,” Janson said. Assuming sponsors step forward, Brane Craft could begin enveloping space debris in nine or 9 years.